Arrange flights, select an Amy villa for rent and book. Booking an Amy Villa is as simple as 1,2,3. 1. Choose your holiday dates, and check on suitable flights to North Cyprus or south Cyprus at flight price comparison sites, for great deals on both charter and scheduled flights. Also check the airlines' own web sites for any special offers. Read our advice on how to find a great flight deal to Cyprus. 2. 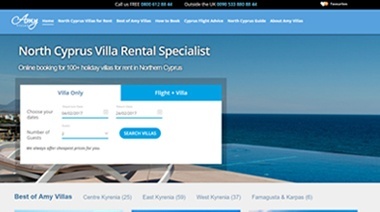 Browse through the quality selection of holiday villas to rent in North Cyprus from Amy Villas, or use our intelligent Search & Book button on the left top side, if you already know where you want to rent your villa, or when, or both! Then, just pick your favourite. 3. Check your favourite holiday rental villa is available on your chosen dates, then just click to book. Scroll down the page to include your airport taxi transfer and North Cyprus car hire in your booking, and you're done! Go ahead, browse through our mouth-watering selection of North Cyprus holiday villas, by clicking on the Location Links on the left of this window. You'll find a wide variety of holiday villas for rent in your chosen area, so just click on each villa's little photo to learn more. If you've never been to North Cyprus before, or need further information on our range of delightful villa holidays locations, click on the North Cyprus Map & Location Choosing Guide link. 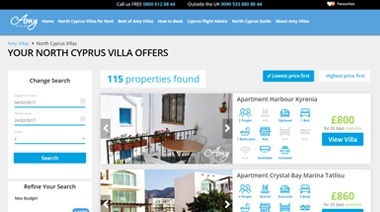 Searching for your ideal holiday villa in North Cyprus is easy with our intelligent Search & Book system at Amy Villas. Already know your holiday dates and the number of people in your party? Simply select your dates and party details from the drop-down menus, and click on the big orange "Search" button. Our super-smart system will only search out villas which are available and the right size for your party, saving you time and effort. And to help save you money too, we'll show you the cheapest available holiday villas in Northern Cyprus first! You can then refine your search to include other features you may wish in your North Cyprus holiday villa, such as a private swimming pool. So, go ahead and find your ideal villa in the North Cyprus sun right now. Enter your details, and click on the big orange Amy Villas "Search" button on the left! • we deal with villa owners direct, so you don't have to! This page is prepared in 195 ms.